Anglicans have been worshiping in Cole Harbour since 1794, first under the direction of the Reverend Joshua Wingate Weeks. Our history as a community, however, had it’s origins 44 years earlier when the British founded Halifax. Needing agricultural settlements to support the population, the land where now stands Lawrencetown was cleared in 1752. Subsequently, it is believed that a road was cut through the Cole Harbour area in 1754 for the first settlers. The present day Cole Harbour Road follows approximately the same route. The farmland, however, was better in the Cole Harbour area so vast land grants were given to influential citizens. For example, in 1765, Benjamin Green and others received a 3,000-acre land grant. In 1781, George Bissett was given a license to occupy land on the harbour. Today, Bissett Road attests to his family’s presence. Other settlers included the family names of Conrad, Giles, Turner, Morash and Settle. These families are still to be found in Cole Harbour and many landmarks testify to their significant presence. It was to this community that Mr. Weeks came to serve as an extension of his mission as the first Rector of St. John’s Parish in Preston. In 1794, he reported to the Society for the Propagation of the Gospel that 12 families were living here. Needing a roof under which to worship, local tradition holds that Col. John Stuart made available a sheep barn for a school in the early 1800’s. The school was also used for services and this became the Anglican community’s first home. The Reverend Charles Inglis, Rector of Christ Church in 1817, reported that as many as a hundred people crowded into this small building for services. The Rectors of St. John’s served this area until 1826 when Cole Harbour became part of Christ Church, Dartmouth. Soon thereafter, the Anglican community was able to worship in their second home, the Meeting House on the crest of Long Hill. While it appears to have been the Methodists who provided the driving force in building the little church in 1830, all denominations worshipped there. According to Mrs. Nickerson (nee Turner), Sunday School was at 10 o’clock in the morning, Methodist services were always in the evening and the Church of England service was at 3 o’clock in the afternoon. One Sunday a month there was no service in the Meeting House and everyone went to the evening service in the Church of England, often gathering in a neighbour’s house after church for a singsong around a piano and perhaps a meal. The ministers were paid very meagre sums and often the offerings were in kind. Mrs. Rosemary Eaton of the Cole Harbour Heritage Society tells us that one minister was reported as having remarked that one year “was a terrible year for turnips”, there being little else. In 1835, George Morash, Jas. Bissett Jr. and W. Lawlor were appointed to raise money to help support the minister of the parish. A memorandum records that Cole Harbour was assessed at 5 pounds as their contribution towards parish expenses. This association with Christ Church meant even greater distances to be traveled by the ministers. In 1831, the Reverend M. B. Desbrisay conducted services at Cole Harbour and other churches. He would travel from Dartmouth to Eastern Passage to Cole Harbour and thence home; a horseback ride of 20 miles in all weathers. It was on just such a long journey to visit a sick parishioner that Mr. Desbrisay died as a result of a fall from his horse. The Reverend Emery Harris recorded in his History of St. Andrew’s Anglican Church that by 1869, the people of Eastern Passage, Cow Bay and Cole Harbour decided the Parish of Dartmouth was too large for one man to handle and that a new parish should be formed. On July 13, 1870, the resolution to become the Parish of Eastern Passage was passed. With the approval of the Bishop, the new parish became a reality with the Reverend Charles Burn as the first Rector. Early 1871 saw the cornerstone of the new church building being laid at the corner of what is now Cole Harbour Road and John Stuart Drive. On November 24, 1872, the building was consecrated and given the name of St. Andrew’s Church. Finally, after 78 years of worshipping in a school and then the Meeting House, the Anglican community of Cole Harbour had its third home which was it’s own. In 1950, St. Andrew’s became part of the Parish of Westphal and then passed to the Parish of the Holy Spirit in 1957. It was not until 1982 that St. Andrew’s became a Parish in it’s own right. It’s first Rector, Father Wayne G. Lynch, became the first full time priest to minister at St. Andrew’s, beginning with us in 1980. As the community of Cole Harbour grew, so did the Anglican community. The farmland once occupied by those early settlers fast disappeared with the development of BelAyr in 1959, Colby Village in 1970 and Forest Hills in 1971. 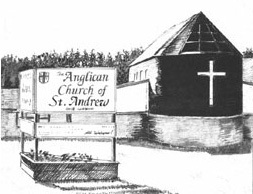 In order to accommodate this growth, St. Andrew’s was forced to seek a fourth home. In 1980 the Family Eucharist and Christian Education classes were moved to Col. John Stuart School, once again giving evidence of our links with the past. Further evidence of these historical ties is the home of Mrs. Margie Bishop, which stands on the same site where Col. Stuart once lived. We worship today in our fifth home, dedicated to God on June 6th, 1987. Three years later, in 1990, Father Melvin Langille arrived as our second Rector. He was followed by Father Peter MacDonald, who served as Priest-in-Charge for a year before Canon David Reid’s arrival in January 1998. The face of St. Andrew’s has changed greatly as it struggled to grow to meet the needs of its’ worshipping community. One thing should never change … the faith and strength of the earliest worshipping community must stand as a model for us today. As the early pioneers settled the land and built their community through faith and hard work, our Anglican community today must continue to build the Family of God through faith and loving ministry.